Love is the intangible, beautiful, and bold thing that deserves a Ketubah with incredible texture to match its depth and complexity. The Dream Reflection Ketubah captures these textures by beautifully blending color and form together in a true expression of emotion. 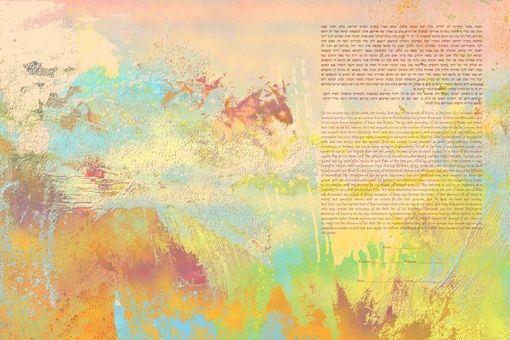 Vibrantly combining warm colors, this Ketubah shows the joy of love, while capturing the essence of excitement and the unknown as a couple embarks on the journey of marriage. Lovers of abstract art (and each other), rejoice! This is the Ketubah you've been dreaming of for your wedding. Recommended material for this Ketubah: Decore Giclee, Canvas-on-Matboard or Wrapped Canvas.